Some of you know that every now and then I go to an art class. It isn’t really a class but Clare the artist who lives on the opposite side of the hill from me, has a slot for me and John and whoever to come and play with paint in her her studio. A fortnight ago in glorious October sunshine she got me outside with an enormous sheet of blank paper and presented me with a vase of sunflowers. They were stunning and of course I could never do them justice but I loved having a go. She has encouraged me to look at the subject rather than my work, so the heads were easy to do and full of energy. Stalks less so and I didn’t get the vase right at all. The flowers would never stand up the way I drew them. I was disappointed as I was pleased with the flowers. I wanted to cut them out and use them in something else. Then Clare – wise woman – said, ” Creativity starts when you make a mistake.” And she’s right. (” A man who never made a mistake never tried anything new.” Einstein this time ). She then proceeded to help me disguise my mistake and I had a go printing with wilting sunflower leaves and getting messy with acrylic paint. I filled in the leafy blanks with inks this week. Oil pastels, inks and acrylics. and then I am going to collage newsprint into the background. ( Not the work of a moment, she warned me, knowing my need for instant gratification). 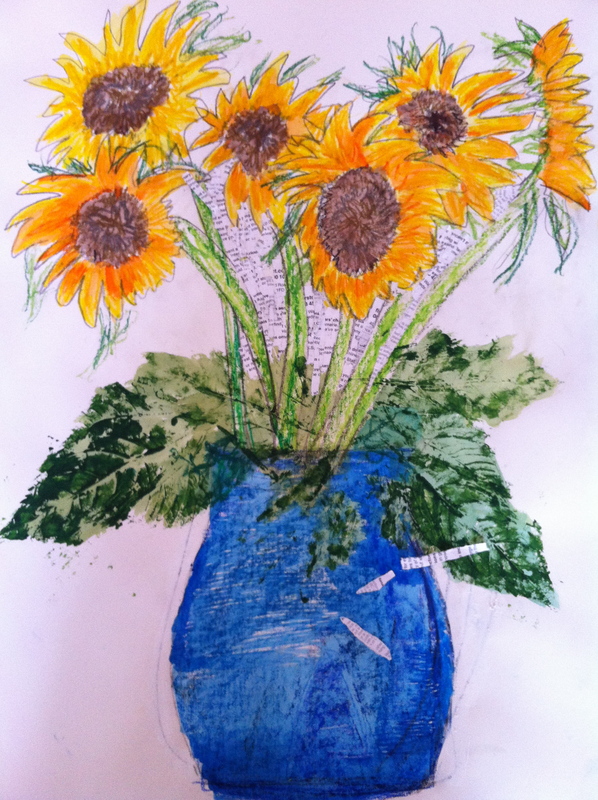 So here I am on Monday afternoon, tearing up newspaper and making my sunflowers stand out from their drab background. Easier than trying to make that vase stand on a table, I’ll tell you. I’ve orange tissue paper saved from a Le Creuset shop for that.